It presents people's first dream to flying with ambition and informal. They are war crafts model of Germany Red Baron. Feels antique flavor. Good for home decoration and can be nice gifts. Can also be Christmas Tree Decorations. If you have any problem of our product, you can click "seller contact" button in your Amazon account to email us. we would be delighted to help you and we will reply as soon as we can. UNIQUE DESIGN - Metal tinplate material and hand painting make them retro decorations. Size: 10x9x5cm/4 x 4 x 2 inch. War crafts model from Germany Red Baron. This mini airplane ornament is made of SOFT metal tinplate material, may bend. If bent, just bend it to the original place GENTLY and LIGHTLY by your hands. 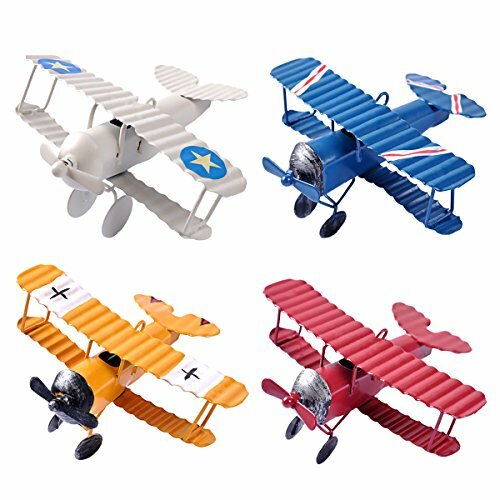 Come in 4 color (White, Yellow, Blue, Red) mini biplane. GREAT DECORATIONS --- The models are perfect for desk decoration, home decorations, Christmas Trees Hanging, Ornament, Kids Toy, Desktop Decor, Photo Props and more. GREAT GIFT AND COLLECTION --- It presents people's first dream to flying with ambition and informal, a great handicrash collection for the vintage airplane lovers. RETRO DESIGN --- These models are retro decorations, and making-replica is a feature of them. Interfaces and patches of traces are normal conditions. If you have any questions about this product by eZAKKA, contact us by completing and submitting the form below. If you are looking for a specif part number, please include it with your message. 8 Pcs Turquoise Decorative Reproduction Blown Glass Float Fishing Buoy Ball with Fishnet 3"